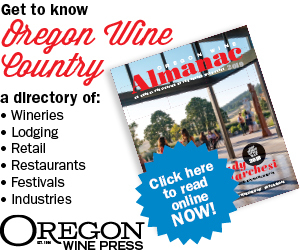 The Oregon Tempranillo Alliance (OTA) today announced that it is in the final stages of preparation for the 2019 Oregon Tempranillo Celebration, which will be held January 18-20 at the Ashland Hills Hotel & Suites in Ashland, Oregon. The Celebration is an opportunity for Tempranillo producers from around the state to gather for a weekend of education, tasting and celebration, culminating with a Grand Tasting, where consumers will have the opportunity to sample from among the best Tempranillo in the state. The production of Tempranillo in Oregon has grown dramatically, with over 368 acres currently planted, producing 1,000 tons of grapes and generating an economic impact over $10 million! Along with that growth has come critical acclaim from wine experts and consumers alike. The programming for January 18 and 19 is devoted to the wine trade, and will feature seminars with a focus on various viticultural and winemaking aspects of Tempranillo. The Celebration typically invites three guest critics to participate in a double blind evaluation of member wines and also chair and participate in the Saturday seminars. The guest critics for 2019 are: Bree Boskov, Master of Wine and wine industry management consultant; Mike Dunne, freelance wine writer and former food editor and wine columnist for The Sacramento Bee; and Alder Yarrow, wine blogger and founder of the highly regarded and award-winning wine blog Vinography.com. The Grand Tasting, which is open to the general public, is being held Sunday, January 20 from 1:00-4:00 pm in the Constellation Hall at the Ashland Hills Hotel and Suites. This is an amazing opportunity for consumers to sample from among the best Tempranillo wines in Oregon, accompanied by an array of sumptuous tapas and a FREE logo souvenir wine glass. The Grand Tasting will also feature a Silent Auction with 100% of the proceeds going to benefit local health care through the Asante Foundation, including the Children’s Miracle Network. Tickets are $50 and are available online www.oregontempranilloalliance.com/tickets.